EMILIO APARICIO-SONIC SCIENTIST AND MUSICAL PIONEER. Nowadays, the words pioneer and innovator tend to be overused, and musicians who create truly groundbreaking music seem to be sadly, few and far between. While there are some pioneering musicians whose music continues to push musical boundaries, there are no longer as many as there once were. Especially in the sixties and seventies, which was a golden period for music that saw creativity and innovation blossom. The sixties and seventies was also when Emilio Aparicio, an electronic experimental musician from Guatemala, who pioneered the use of the Moog synth in Latin America. In doing so, this sonic scientist and musical pioneer created groundbreaking music that was way ahead of the musical curve. This was the start of the career for a man who later, would become one of Guatemala’s most innovative musicians and enjoy a career as an academic and inventor. Before embarking upon a musical career, Emilio Aparicio was a student at the National Music School, in Guatemala City. That was where he first came across fellow student and member of Abularach dynasty, Roberto Abularach. Twenty-one year Roberto Abularach came from a very different background to Emilio Aparicio, but their paths would cross after they had completed their respective studies. After leaving the National Music School, the friendship between Emilio Aparicio and Roberto Abularach continued. By then, Roberto Abularach was managing the La Estrella warehouse in the Zona 1. It was where musical instruments were imported into Guatemala and sold. However, before long the warehouse was a favourite place for local musicians and bands. Soon members of Apple Pie, Modulo 5 and Cuerpo y Alma and were hanging out at the La Estrella warehouse. So were local musicians who weren’t part of bands. Some of these musicians went on to form bands, including Les Prince. Many of the bands and musicians were supported by Roberto Abularach, who became their patron. There was no ulterior motive to this, as Roberto Abularach was a kind, generous and wealthy young man. Not only did Roberto Abularach’s generosity include helping musicians buy their instruments, he sometimes gave instruments to musicians embarking upon musical careers. One of the musicians who made their way to the La Estrella warehouse was Emilio Aparicio. A graduate of the National Music School, Emilio Aparicio had two passions in life, music and electronics. When he entered the La Estrella warehouse he remembered Roberto Abularach from the National Music School. Soon, they started talking and realised that they had much in common. This was the start of a close friendship. Emilio Aparicio and Roberto Abularach enjoyed long conversations on music and electronics. By then, Roberto Abularach had spotted Emilio Aparicio’s potential, and was keen to help his friend. The opportunity arose when Emilio Aparicio decided to buy purchase what was his very first piano. However, the piano was expensive, so Roberto Abularach helped his friend buy the piano. This Emilio Aparicio put to good use, and his talent blossomed. Over the next year, Emilio Aparicio interest in electronic and experimental music grew. This was something he discussed at length with his friend Roberto Abularach, who in 1969 was about to journey to New York. During Roberto Abularach’s visit to New York, he visited the Modern Art Museum. That was where Roberto Abularach saw the very first Moog synth, which had been presented to the Modern Art Museum by its founder Robert Moog. Having seen the Moog synth, Roberto Abularach decided to purchase one directly from its inventor, Robert Moog and take it home to Guatemala. When Roberto Abularach met Robert Moog, he bought a 3P modular synth which bore the serial number 00003. This was only the third Moog modular synth that Robert Moog had made, and Roberto Abularach was taking it home to Guatemala, where it would go to a good home. Given his interest in electronic and experimental music, it seemed fitting that Roberto Abularach gave the Moog 3P modular synth to his friend Emilio Aparicio. His passion for music and electronics, and interest in both electronic and experimental music meant he would put the Moog to good use. Having gifted the Moog 3P modular synth to Emilio Aparicio, Roberto Abularach had it installed in his friend’s home in late 1969. Roberto Abularach told Emilio Aparicio that the Moog was his, and he had complete freedom to use the synth in whatever way he wished. While Emilio Aparicio had gained a synth, he had also gained a patron and the man who would support and champion his music. From late-1969 until 1971, Emilio Aparicio transformed a room in Roberto Abularach country mansion in Zona 12 into a makeshift studio. This was the perfect location for a recording studio, as the country house was empty for much of the year, which allowed Emilio Aparicio to concentrate all his efforts on writing and recording new and innovative music. In his new studio, was Emilio Aparicio’s newly acquired Moog 3P modular synth and some of the early drum machines. Compared to the drum machine available nowadays, the drum machines were almost primitive. Meanwhile, it took time and patience to work with the Moog 3P modular synth. It was a relatively instrument which its inventor Robert Moog had demonstrated in early 1967. Even two years later, only a relatively small number of people knew how to setup and use the Moog synth. Through patience and persistence this now included Emilio Aparicio, who had even worked out how to deal with a couple of common problems. One of the problems that Moog users encountered were that the its oscillators were somewhat unstable. However, soon, Emilio Aparicio realised that if he switched the machine on way before the session began, this allowed them to warm up. Occasionally, the Moog failed to stay in frequency and the tuning was out. Emilio Aparicio knew to expect teething problems with such a complex and groundbreaking piece of equipment. Having got to grips with the Moog 3P modular synth, Emilio Aparicio started making music. Sometimes, the seclusion that Emilio Aparicio enjoyed was interrupted when Roberto Abularach arrived at his country house. Sometimes, he was joined by various musicians and poets, and the assembled company experimented with hallucinogenic drugs including LSD and Floripondio. This helped Emilio Aparicio open the doors of perception, as he created experimental, innovative and ambitious music. Not only did the Moog 3P modular synth transform now Emilio Aparicio made music, but also what type of music he made. It was unlike most of the music being made within Guatemala, especially what the pop and rock bands were making. Instead, the music that Emilio Aparicio was making had more in common with the electronic and experimental music being made in Europe and America. As the sixties gave way to the seventies, Emilio Aparicio continued to spend long periods of time in the studio he had built in Roberto Abularach’s country home. Little did anyone who visited the studio or even heard the music realised that Emilio Aparicio was making the music of tomorrow, today. After two years locked away in his studio, Emilio Aparicio had completed ten tracks. There was only one problem, though, Emilio Aparicio had no idea what to do with the music? Emilio Aparicio wasn’t chasing the rock star dream, and had no interest in fane and fortune. His interest was making music. Fortunately, his friend and patron, Roberto Abularach, who continued to champion Emilio Aparicio’s pioneering music had come up with a plan to introduce his friend’s music to a wider audience. To do this, Roberto Abularach planned to use one of one of the Abularach dynasty’s businesses, Salvavidas Rojas. 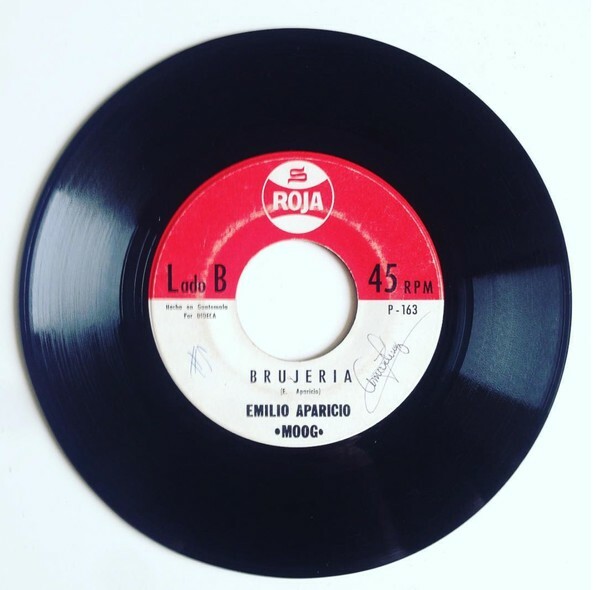 It was a popular drink within Guatemala, and Roberto Abularach had come up with a plan that if customers sent four corks from Salvavidas Rojas’ bottles and three quetzal coins they would receive the five volumes of 45 singles featuring the music that Emilio Aparicio had recorded between late-1969 and 1971. This must have seemed a good idea at the time. Sadly, very few people took the time to collect the corks and return them to Salvavidas Rojas. 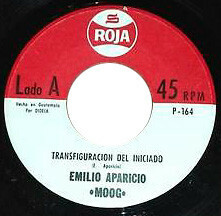 Those that sent away for Emilio Aparicio’s five singles, didn’t understand the music. It was unlike anything they had heard on the radio or bought in local record shops. What didn’t help was that Emilio Aparicio didn’t play live and wasn’t part of a band. Instead, he was a relative unknown, who was part scientist, sonic explorer and musician, whose natural habitat was the recording studio. That was where he had spent the best part of two years recording the five singles that were given away with bottles of Salvavidas Rojas. It was frustrating that people who sent away for the records often threw them away, or that they were recycled with the other discarded vinyl. Meanwhile, in the Salvavidas Rojas factory piles of unclaimed vinyl sat in the store rooms. They too, were destined for the recycling plant. This was something that many people would later regret. Following the failure of his first release, Emilio Aparicio dusted himself down and created his next project, La Banda Plastica. Just like his previous project, La Banda Plastica was an experimental and non-commercial project. It was signed to Guatemala’s biggest record label Dideca. They gave Emilio Aparicio total freedom to record whatever he wanted. This was unusual for Dideca, who usually told bands and artists what type of sound they expected from them. Dideca frowned upon music that wasn’t commercial or had an aggressive sound. That was a no-no. The exception to this was Emilio Aparicio and his new La Banda Plastica project. However, deep down, executives at Dideca and Emilio Aparicio knew that a single from La Banda Plastica had no commercial appeal. La Banda Plastica released just a couple of singles, including Libertad Viene, Libertad Va. Neither single sold well, and the majority of the singles were given away to DJs at radio stations during the Christmas period. This brought to an end what was a somewhat surreal period for Emilio Aparicio. Sadly, after the commercial failure of La Banda Plastica, Emilio Aparicio became a much more reclusive figure, who recorded purely for his own interest. The music Emilio Aparicio made he had no intention of releasing. That was his hobby, while the jingles and videos he made for television and technical companies paid the bills. Later, Emilio Aparicio changed direction and started working with computers. He went on to build the first ever computer to be used by the National Bank of Guatemala. Emilio Aparicio had come a long way from when he started working with his Moog synth. By the early eighties, Emilio Aparicio was one of the leading lights in electronics and technology in Guatemala. He was also working on a new piece of musical technology which he hoped would be used by musicians and bands across the world. This was a guitar synth, and he presented the prototype at Audio Engineering Society’s conference when it took place in Anaheim, California, in 1982. While Audio Research bought patent for the guitar synth, developing it proved problematic. Emilio Aparicio’s invention never made the same impression as Robert Moog’s Moog 3P modular synth. Still, Emilio Aparicio never lost his love of music, and he continued to record at the home he shared with his wife. Now Emilio Aparicio was recording onto cassettes, which were cheaper and allowed him to record much more music. These recordings were only heard by the person who was closest to him…his wife. She was his musical confidante. It was as if Emilio Aparicio feared that his music would be rejected for a third time. As a result, the music he recorded has never been released. While music was Emilio Aparicio’s first love, he gradually started to concentrate his efforts on video art in his spare time. By day, Emilio Aparicio was a professor at the Galileo University, which was founded on October ’31st’ 2000 in Guatemala City. Emilio Aparicio taught a new generation of computer scientists, who knew nothing about his former career in music. Sadly, Emilio Aparicio fell victim to prostate cancer and passed away in 2012. That day, Guatemala lost a musical pioneer, who pushed musical boundaries to their limits, and sometimes, way beyond. Proof of that was the genre-melting music that Emilio Aparicio made between late-1969 and the early seventies. Sadly, Emilio Aparicio only released eight singles, although he later went on to write the music for television, films and adverts. However, the singles that Emilio Aparicio released were way ahead of their time and incorporated elements of disparate musical genres. This included everything from electronic and experimental music, to abstract and avant-garde, through to Latin and psychedelia and even dub, jazz, musique concrète pop and rock. Emilio Aparicio who was a true musical pioneer combined the music of the past and present to make the music of the future. Sadly, apart from a few aficionados of electronic and experimental music, sadly, very few people will have heard of Emilio Aparicio or the music he made. However, this little known musical pioneer, who created ambitious, innovative and imaginative music during what was a short, but unsuccessful recording career. However, Emilio Aparicio music has the potential to inspire a new generation of electronic musicians, and is a reminder of a sonic scientist and musical pioneer who created groundbreaking music that was way ahead of its time. ← MORENA Y CLARA-NO LLORES MAS. The blood, sweat, tears and pain that so many go through for their art and creations is almost hard to imagine. This is quite a story. Amazingly researched as usual. Wow! Glad I’ve heard of him now thanks to Derek!